The day 2 of Lakme Fashion Week Summer/Resort 2017 was dedicated to sustainable fashion in India. There were designers who showcased their designs revolving around the central theme as sustainable fashion and inclusivity. The highlights of the day included Lakmé Fashion Week collaborating with the NGO Kranti that empowers girls from Mumbai’s Red Light areas to be agents of social change who walked for the Mandeep Nagi of ‘Shades of India’ at the 6Degree Studio during Lakmé Fashion Week Summer/Resort 2017. Designer Aneeth Arora’s The Forbidden Garden’ range inspired by the painter and botanist Pierre Joseph Redoute from Southern Netherland was spectacular, it was a vision to see how the hand embroidered buttas resembled the paintings on canvas. (ALSO READ 10 hottest designs from Lakme Fashion Week 2017 day 1 that you must have in your wardrobe this year!). The Artisans of Kutch show at Lakmé Fashion Week Summer/Resort 2017 was one of the most interesting shows for the lovers of Kutch traditional craft and sustainable fashion, with the ‘Shrujan’ designers adding values to many wardrobes. Then there was Sanjukta Dutta reflecting true communal harmony and serenity of Assam, inspired by Goddess Durga and traditional Assamese motifs. (ALSO READ Adah Sharma’s cute LFW day 2 showstopper outfit is an added asset in every summer wardrobe!). 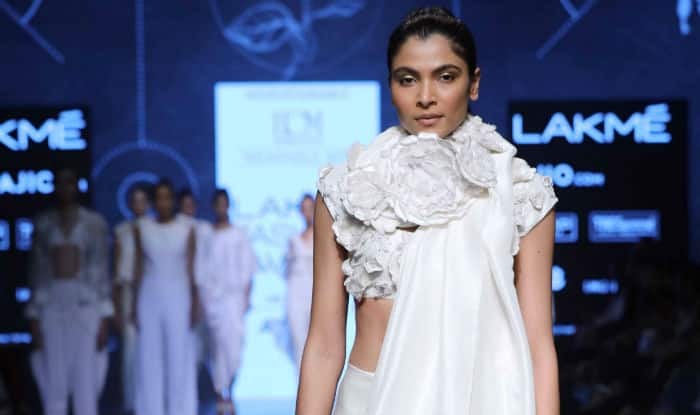 Designer Lipsa Hembram presented her collection ‘Simplify’ for her label ‘Galang Gabaan’ at Lakmé Fashion Week Summer/Resort 2017 and the collection had rich organic dyed textiles from Kotpad with hues like beige, white, ecru. Bollywood actress Adah Sharma was the showstopper for Galand Gabaan. (ALSO READ Preity Zinta looked spectacularly stunning when she walked the ramp at LFW 2017 for designer Sanjukta Datta!). #LakmeFashionWeek Summer/Resort 2017 day 2. #LakmeFashionWeek Summer/Resort 2017 presents #ArtisansOfKutch. The Artisans of Kutch collection #GoSustainable #5DaysOfFashion #Fashion. The elegance of simplicity and indulgence of comfort. Preity Zinta made her presence felt in this beautiful creation called Mekhela Chador by Sanjukta Dutta. #LakmeFashionWeek Summer/Resort 2017 presents #Reincarnations. Each of these collections hold their own interesting sustainable story. #LakmeFashionWeek Summer/Resort 2017 presents The House of Milk. Another attraction for the day 2 of Lakme Fashion Week Summer/Resort 2017 was the ‘Healing Garments’ collection from ‘The House of Milk’ by designers Reshma Merchant and Priyanka Kaul Lakdawala. The collection incorporated the goodness of organic herbs such as neem and tulsi to create healing fabrics that not only redefined the sartorial aspects of the wearer but enriched the soul with its calming effect. The nontoxic fabrics treated with Ayurvedic herbs along with the brand’s sublime jewellery and accessories created a relaxed ambience. The the official partner of Lakme Fashion Week 2017, the AJIO.com unveiled three fabulous collections at The Sustainable Man show to conclude Day Two at Lakmé Fashion Week Summer/Resort 2017.